She has inspired the greatest artists, poets and composers for two-thousand years. Armies have fought under her banner, while entire cities and nations have placed themselves under her patronage and protection. Every day, she is called upon by countless men, women and children to help them in their necessities: "Hail Mary, Full of Grace." She is the Mother of Jesus Christ . . . The Mother of God. Devotion to the Blessed Virgin Mary is, perhaps, the most instantly recognizable manifestation of the Roman Catholic Faith. Those outside the Church are hard-pressed to explain it, and they too often view Marian devotion as either a "distraction" from the adoration due to Jesus Christ, or as something "acceptable," but only to a severely limited extent. In reality, the Church's Marian heritage is an integral part of the ancient Faith, and there can be no proper understanding of the Person of Jesus Christ, True God and True Man, without a proper appreciation of, and respect for, the Catholic Church's Marian teachings. "And the Word was made flesh and dwelt among us," wrote St. John the Evangelist of the Son of Mary, Our Lord Jesus Christ. The Incarnation, as an event to hope for if one were living before Christ, and as an event to be thankful for, (for those who live after), is the proper object of the virtue of faith. And the more we know of Mary — of her person, her place in the history of salvation, and her role in the Church founded by her Divine Son — the greater will be our knowledge of Jesus, and the closer will we be our assimilation to Him. 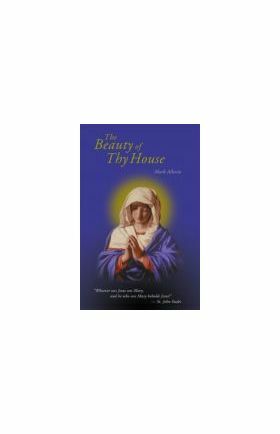 Drawing from the Old and New Testaments of the Holy Bible, the writings of saints, fathers, doctors and popes, the decrees of Church Councils, and the insights of theologians, The Beauty of Thy House offers the reader an "introduction" to the Mother of God which takes nothing for granted. 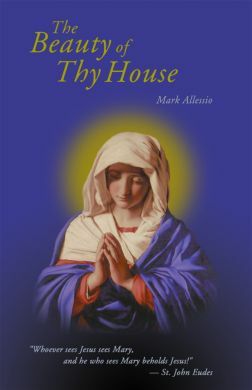 This verbal portrait starts "from scratch"; and, as each chapter progresses, more and more is revealed of this unique woman — Mary — as, along the way, all the Catholic doctrines concerning her fall into place. Over the centuries, innumerable works have been written on the Blessed Virgin Mary. These writings range from the poetic to the theological, from the language of the artist to that of the philosopher. The greatest minds of the Catholic Church have always considered Mary to be an object most worthy of scrutiny and — a study that never fails to reward. This cornucopia of knowledge and contemplation was produced primarily from the overflowing love of her devotees', out of their love for an individual, for a flesh and blood woman, for the Mother of God. Why is this so? Why such an outpouring of love and esteem for the Mother of the Redeemer? The answer to this query makes for a most edifying journey into the history of God's relationship to Man.